Everyone’s favorite week of the year is almost here…Shark Week! So grab your friends and kick the week off by throwing your very own viewing party. All you need is some tasty treats, theme drinks and some comfy seating options for your guests. 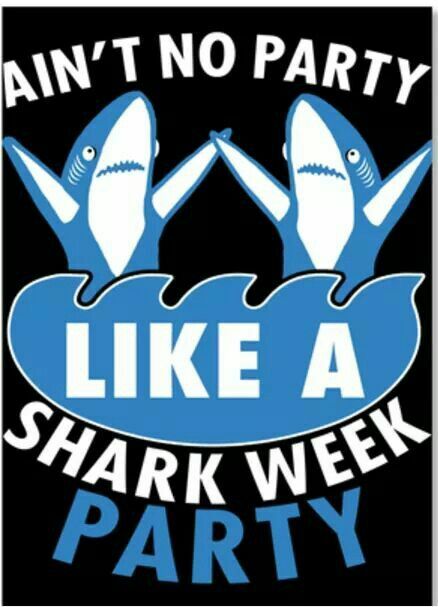 Before you know it you will be ready to sit back and experience the jawsomeness that is Shark Week! First things first, you can’t have a Shark Week Viewing Party without a little chum for your guests. Below are a few fun and easy appetizers to get the party going that require minimal effort! The next great addition to your Shark Week viewing party are theme drinks! After scouring the internet I found some great concoctions to incorporate into your drink menu for the Shark Week extravaganza. Named for its beautiful blue appearance and spiced rum bite, this drink will definitely spice up your soiree! Click the image for the recipe. This blood red cocktail will be an excellent punch bowl drink to incorporate into your Shark Week viewing party! Click the image for a complete recipe. Seating at a viewing party is crucial! It's important that everyone has a clear view of the TV and there is plenty of room to comfortably fit everyone. Depending on the number of guests you plan to have at your viewing party you can make the seating as formal or informal as you would like! For those that are brave, another fun idea for your Shark Week viewing party is incorporating one of the many different Shark Week drinking games found on the internet into your viewing experience. Below is an example of one I have found that definitely sounds like it could be fun, remember to drink responsibly! Don't forget to be prepared with a schedule of the showtimes for all your favorite shows! This schedule can be found on the Discover Channel Shark Week website, available now! Happy Shark Week everyone!